I love horror novels as much or more than I love horror movies, but most of them only affect me in the moment. Like many people of my generation, I grew up reading Stephen King novels as they came out. I was a teenager when I read IT for the first time, on a visit to my grandparents’ house in New Jersey. While their neighborhood was nothing like small-town Derry, Maine, it did have the same kind of old-style gutters depicted in the novel, and I spent most of that summer crossing the street to avoid the possibility that a killer-clown might be peering up at me from within one. I’ve often said that Stephen King and Garrison Keillor have the same folksy style, but that the difference is that Keillor isn’t going to have a monster show up to dismember you on page twenty six. I believe one of the reasons King’s work sticks with us isn’t the films, which, let’s face it, are never as scary as the books, but the fact that he sounds like every hometown storyteller, sucking you into small-town life. Ever read a book you thought you could have written better yourself? I don’t have titles falling of the tip of my tongue, but I know that there have been books where half-way through (or sooner) the dialogue has been so stilted or otherwise unrealistic, or the awareness of space and objects so bad, that I’ve entertained thoughts of writing it better. Ultimately, however, I end up either finishing the book and grumbling about it, or not finishing the book, and grumbling about it. As much as I love the wide variety of free ebooks that are out there, I have to say that while many are very, very good, there are an equal number that were published by people who should never again be allowed near a keyboard without supervision. When I interviewed Marsha Mason for ATG a couple of years ago, we talked about her memoir, and she said she believes everyone should write. I agree. Everyone should write, whether it’s fiction, letters, or a diary. But not everyone should publish, even on Amazon. I should add, however, that sometimes a poorly written story still has an amazing or interesting concept, and when I do think, “Oh, I could do that better,” it’s generally the concept I’m responding to. The Sunday Salon: Monster Mash? When we think of monsters – not monstrous people or monstrous acts – but Hollywood-style monsters, two of the first that come to mine have to be Frankenstein and Dracula. Two years ago, as part of an English/Literature tutorial for a friend’s son, we studied Bram Stoker’s Dracula, and noted the differences in the way the character was written and the way he’s appeared since. For example: Dracula can walk about during the day, but his powers are limited to that of an ordinary person; his powers include the ability to take the forms of bat or wolf, fog, or elemental dust. By this time the gypsies, seeing themselves covered by the Winchesters, and at the mercy of Lord Godalming and Dr. Seward, had given in and made no further resistance. The sun was almost down on the mountain tops, and the shadows of the whole group fell upon the snow. I saw the Count lying within the box upon the earth, some of which the rude falling from the cart had scattered over him. He was deathly pale, just like a waxen image, and the red eyes glared with the horrible vindictive look which I knew so well. But, on the instant, came the sweep and flash of Jonathan’s great knife. I shrieked as I saw it shear through the throat. Whilst at the same moment Mr. Morris’s bowie knife plunged into the heart. More than one more modern author, among them Fred Saberhagen, has looked at this death scene, and noted that since 1) You can’t kill a vampire with a knife, and 2) Dracula crumbled into dust, he was not actually killed at the end of the novel. A novel, which by the way, he appears on only 58 pages of. The rest of the 200+ pages are spent talking about him, his powers, his deeds, and everyone else’s life. Like the shark in Jaws, Dracula-the-character is scariest when we don’t actually see him. But Dracula was a past project. For the last month, I’ve been reading mysteries, partly because I love them, but partly because it’s autumn, and I think mysteries go well with lengthening shadows and crisper evenings, but the book I began this morning takes me back into classic monster fare. It’s Mary Shelley’s Frankenstein, which, I’m almost embarrassed to admit, I’ve never actually read. I remember seeing Boris Karloff as the Monster in the old movie, and being chilled at the scene with the little girl, the Monster, and the flower. 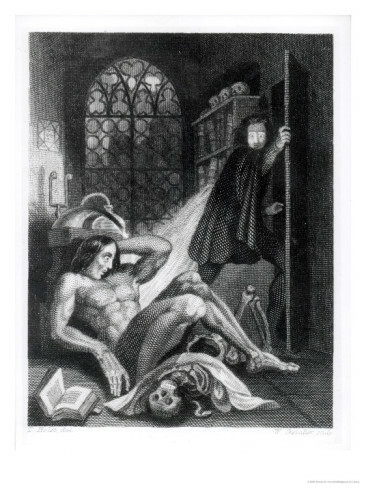 I remember reading riffs on Frankenstein, and of course I know that Rocky Horror for all its silliness is still derivative of Shelley’s work. So as the nights lengthen further, the weather grows cooler even where I live, in Texas, and the shadows turn into puppet creatures beckoning us to explore the dark and deep parts of our psyches, I’m about to take a break from conventional mysteries and thrillers, leave the comfort of cozy novels, and begin reading Frankenstein. There aren’t a lot of books that really make me sad, though there are many books with individual moments that cause me to get a little weepy. One book that does make me sad, however, is Mitch Albom’s Tuesdays with Morrie. I actually only read it for the first time last month, but it made me sad, and it made me angry – we don’t treat our older citizens very well – and it made me miss my grandparents. September is nearly over, and I’m pretty sure I haven’t finished reading a single book. As is my custom, I have several started, but nothing is capturing my attention. I could blame work, or the weather, or any number of other things, but the reality is that I just haven’t been able to fall into anything I’m reading. I have this urge to invite people over just to read plays or short stories and discuss them. Not books. I have no patience for book clubs and book groups, because I read too quickly (most of the time), and by the time everyone else has finished the book, I’ve read five others. I was this way in school, too, which made literature classes difficult for me. I wish it had occurred to me to ask for the exam work as soon as I finished reading a book; it never did. And so, this blog lies empty-ish, and I skipped posting anything to Sunday Salon last week, and I want to read, I do, but my brain won’t engage. On the other hand, I’ve written twelve pages of a story I’m working on for fun, and five of my novel, so the month hasn’t been completely useless. The 30-Day Book Meme asks me to write about a book “that makes me happy,” and the first title that popped into my head is Bread Alone by Judith Ryan Hendricks. I love this book so much – about a woman who is dumped and left mostly penniless by her cheating husband, moves to Seattle, works in a bakery, and eventually rediscovers her best self, her romantic self, and her love of baking and fabulous bread. Partly, I love this book because it’s a cafe story, and partly it’s because – except for the cheating husband part – she’s living one of my fantasies. I’ve bought and given away multiple copies of this novel. It’s well written, draws you in, and has vivid characters. If only it came with freshly-baked sourdough, it’d be just about perfect. When I was fourteen, I read Nicholas and Alexandra several times, and loved it every time. Some of my go-to books are biographies, published journals, etc. Madeleine L’Engle’s Crosswicks quartet are a series of her jounals turned into books, that were contemporary (more or less) when originally published, though have become historical now. I love biographies, but the most recent I’ve read, those of Hilary Clinton and Queen Noor, are more contemporary than not. I love memoirs, but most of those I’ve read recently, like Carlos Eire’s Waiting for Snow in Havana, and my birthday-book from my aunt this year, Under the Big Top: A Season with the Circus have also been fairly contemporary as they both take place in the 20th and 21st centuries. I know I’ve read things that are truly historical, but nothing of that ilk is speaking to me just now.